The sun is blanketing San Francisco in a toasty glow, and for once, people are wearing t-shirts outside. But all that’s on my mind is why in the world I’m spending an entire morning test-riding a Yamaha Zuma scooter to write this Wired review. I have a red-eye to catch to New York in 12 hours, and a speech to give for my book tour right after I hop off the plane. In six days I co-launch a new website. In two weeks I have to file the second draft of a documentary screenplay before the filmmakers fly to Egypt. I’m cutting it close, and to make matters worse, this bike is so slow. I open the throttle all the way. I hear the engine moan as the bike crawls up a hill on Geary Boulevard. Anybody who’s ridden a bicycle could probably figure out the Zuma in a few minutes. To top that off, it gets an estimated 132 miles per gallon. Yamaha’s marketing team has handed each motorcycle journalist an Olympus camera to sling around our necks, and each of our scooters is equipped with a Garmin GPS on the right handlebar. The company has asked us to participate in a scavenger hunt, where we ride to each location programmed into the GPS and snap a photo. “Bonus points if you include the scooter in the photos,” says Tim, Yamaha’s public relations head. I smile during the press briefing, but I can feel my internal stress bomb ticking impatiently. I need to be 2,600 miles across the country soon, and I haven’t even finished writing my talk yet, so I just have to zip through this scavenger hunt as fast as possible. But this bike is so damn slow. Riding along with me is David, a Yamaha marketing manager who looks to be in his 40s, with short, dark hair and black-rimmed glasses. We chat casually as we pull up in front of stoplights about how long we’ve been doing our jobs and what motorcycles we ride (turns out David, who’s been in the auto-marketing industry for over a decade, doesn’t own one, but borrows bikes occasionally from the company to ride with his son). I ask him who the target audience for the Zuma is, because I can’t personally understand why anyone would want such an under-powered vehicle. I understand David’s points about price and motorcycle licenses right away. But as I sluggishly ride up a hill on Gough Street, the realization strikes me like a hammer hitting the chime of a grandfather clock. The retired people who buy this bike want it because it can’t go fast. They want their lives to slow down. They’re done zooming down the roads. They’re content with everything they’ve accomplished with their lives. So I concede. 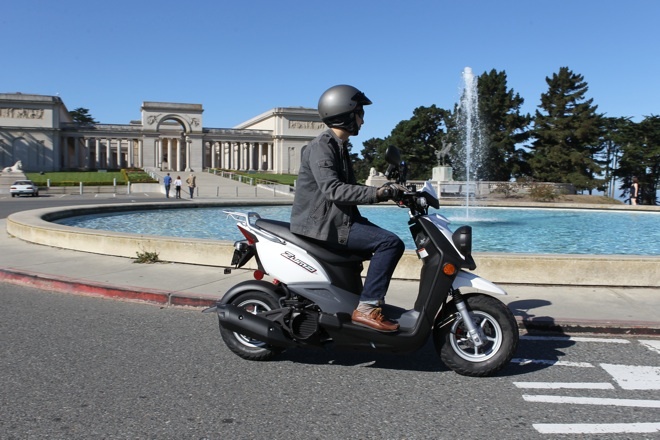 As slow as it may be, this Zuma is fine for casual touring, especially in urban towns. It’s got huge storage under the seat — big enough to stuff a loaded laptop bag inside — and a collapsible hook on the glove compartment for holding grocery bags and a spare helmet. Its four-stroke engine accelerates from zero to 40 smoothly, though it struggles on steep hills, as you would expect a 49cc scooter to do. The bike handles fine and operates easily; anybody who’s ridden a bicycle could probably figure out the Zuma in a few minutes. To top that off, it gets an estimated 132 miles per gallon, enough for at least two weeks of riding before you need to fill up. Not a bad investment for $2,500. I reach the second destination programmed into the GPS — Dolores Park in the Mission District — and park the bike to snap a photo. I glance at my watch, and it’s already 12:30 in the afternoon. David tells me the scavenger hunt is expected to last another four hours before all the journalists meet Yamaha for dinner. I apologize and tell him I have to ditch the scavenger hunt early to finish up my work before I fly to New York. I scramble back to the Wired office to wrap up my speech, then take a cab home to do a load of laundry, pack my bags and hurry to the airport. The plane takes flight, and I gaze out the window at the city lights, my eyes strained from a daylong adrenaline rush. A single thought echoes in my head: I need to slow down. 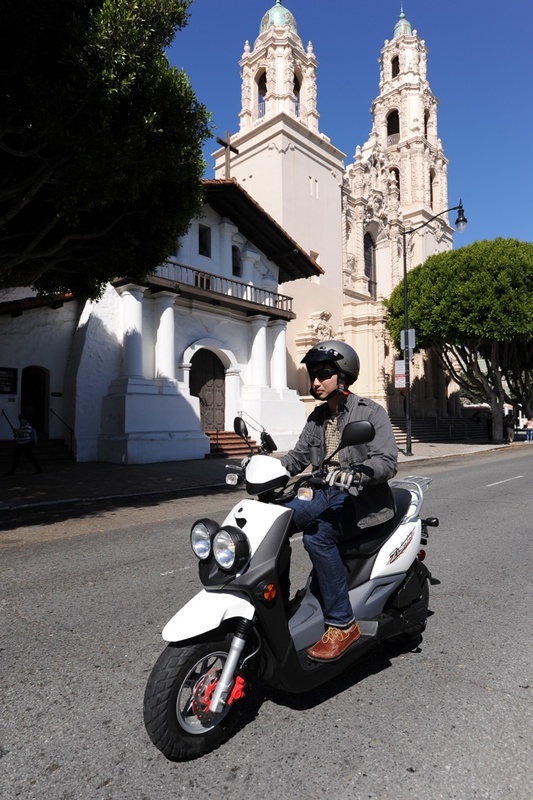 Photos of Brian courtesy of Yamaha Motor Corp.